Chances are if you played Scribblenauts or Super Scribblenauts on the Nintendo DS then you were absolutely astounded by the vast dictionary that allowed you to conjure up seemingly endless creatures, objects, and internet memes. 5th Cell delivered innovation with both of these games, but neither title can truly be considered perfect. 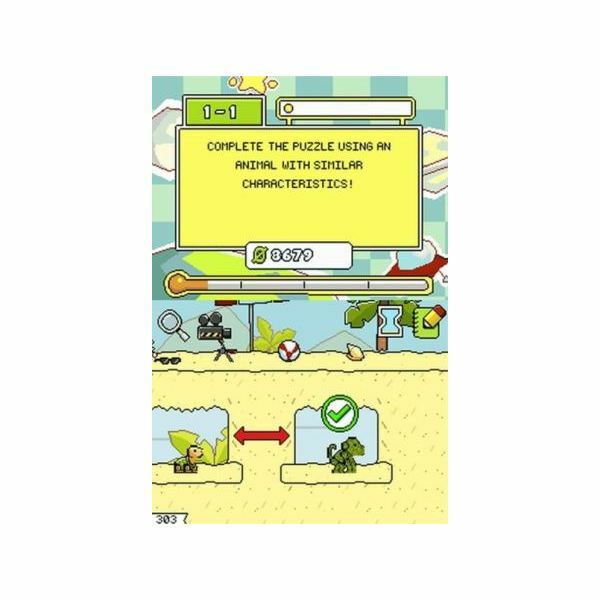 Scribblenauts is plagued with poor controls and a few confusing objectives, and Super Scribblenauts doesn’t encourage the type of imaginative thinking that made the first game so popular. Let’s take a look at both of these games and see which provides the better gameplay experience. Any Scribblenauts review you come across will likely praise the game’s vast dictionary of words, which features common terms as well as offbeat words and phrases. This is easily one of the game’s main draws, and having this massive sandbox world to play around with in the palm of your hands definitely makes Scribblenauts stand out. If you want to summon massive demons and have them battle a guild of knights, you can do that. If you want to ride a Pegasus into the sky to solve a puzzle, you can. Scribblenauts is a true work of innovation. Sadly, a few flaws hamper the experience and keep it from being as superb as it could be. The major flaw in the game is the control system. Relying entirely on the DS’s touch screen, the Scribblenauts experience is marred with often problematic controls. Positioning objects onscreen is tricky at times, and controlling Maxwell certainly isn’t a breeze. All too often gamers end up sending the rooster hat-wearing hero down a chasm and into a tragic death. For the most part, the puzzles in Scribblenauts are designed cleverly. Even what seems like the most mundane of tasks can be solved in a unique manner. Though tools such as ladders or rope can be used to reach high places, solutions involving jetpacks or griffins are all welcome as well. A few of the game’s puzzles do suffer from ambiguous objectives, though. These instances result in frustration and confusion, and they take a bit of the game’s charm away. When 5th Cell revealed to the world that the sequel to Scribblenauts was going to implement adjectives into the mix, fans of the original couldn’t be more excited. The addition of descriptive words only makes the game’s massive dictionary even larger, and it allows players to create insane objects such as giant winged couches, tame striped lions, and fat ugly kings. You can literally type these words into the game and see them appear before your very eyes. Unfortunately, one of the things that really puts a damper on the whole experience is the game’s restrictive puzzles. Sure, you can summon some really inventive objects and creatures, but most of the puzzles never really allow you to use them. This is because a lot of the brain teasers in Super Scribblenauts require specific objects. This not only takes the creativity away from the game, but it makes for some truly frustrating guess work (just check out our Super Scribblenauts review and you’ll see what I mean). Taking notes from the first game, 5th Cell improved the controls in the second game and added D-Pad and face button controls that make controlling Maxwell a lot easier than in the first game. Placing and moving objects is also easier. Unfortunately, these great additions and modifications don’t take away the fact that the puzzle design in Super Scribblenauts is lackluster at best. More freedom would have gone a long way. 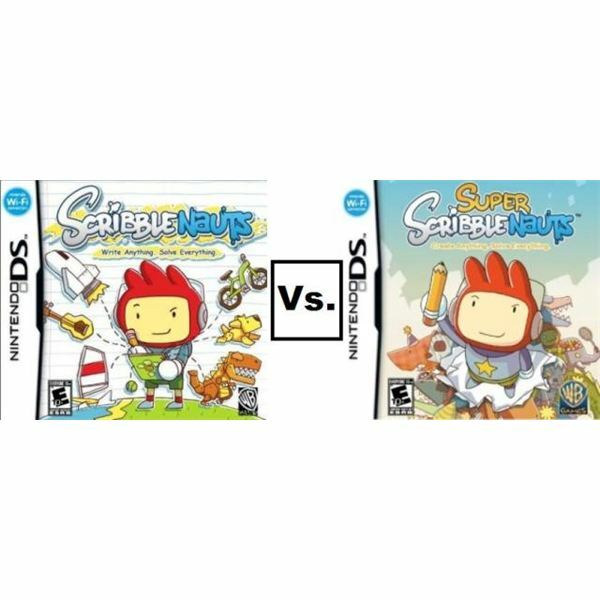 Looking at Scribblenauts and Super Scribblenauts side to side, both games are actually very different from one another. Though the first game is marred with problematic controls and a handful of weak puzzles, it’s a solid package overall because of the freedom it gives gamers to solve its vast number of puzzles. Super Scribblenauts, on the other hand, features improved controls and an excellent adjective system. Sadly, these features are overshadowed by the game’s specificity issues that force you to think within the box for most of the puzzles, making it fun at times, but frustrating all too often. These specs make the first Scribblenauts come out on top over Super Scribblenauts, and they make it an easier game to recommend.